This Eastern Eye release by Madman has been dubbed as the "long-awaited sequel to Bruce Lee's Fist of Fury" that although does fit into this category, it seems more a remake or a token event at a sequel like the excellent Tron: Legacy as opposed to that bad 80's sci-fi film. Unfortunately at times, Legend of the Fist: The Return of Chen Zhen seems to be cashing in on the Bruce Lee name and although it's not the most original martial arts movie, it is quite acceptable, especially with the fight scenes, albeit overtly clichéd story. Even so, the movie has a stellar Asian cast that include Donnie Yen, Shu Qi, Anthony Wong Chau-sang, Yasuaki Kurata and Shawn Yue who are under the direction of the excellent Mr. Andrew Lau. The story is set in the 1920's that sees China threatened by the powerful Japanese as they push towards Northern Shangai. As the city is in turmoil from international takeovers, there is a cabaret club called Casablanca that is a crossroad for all those who visit Shangai such as the Chinese, British and Japanese. This is where the legendary hero Chen Zhen makes his move against the growing power of the Japanese, disguised as a masked warrior (more akin to super hero than warrior) who attempts to thwart the Japanese by rescuing key individuals who the Japanese have targeted. Of course, Chen Zhen is believed dead but when sightings and stories of him surface, the people of Shanghai have a new hope. It's also amusing to see Donnie Yen play almost two totally opposite characters here, that of entrepreneur Ku and that of the legendary warrior Chen Zhen. Joining Donnie Ken is Shu Qi as Kiki, a beautiful singer at the Casablanca which does serve as some sort of love theme for our hero but has a very interesting history that may clash with the legendary martial arts hero. Story aside, the power behind this film is the Kung Fu which looks quite spectacular once the battles commence, especially the almost computer game like boss battle at the end of the story. One aspect I did notice with this film is the Japanese anti-sentiment which is heavily played in this story but considering the era and history, it is understandable in this content. At times Legend of the Fist: The Return of Chen Zhen tries a little too hard and ends up being a poor man's version of the Green Hornet and when compared to Bruce Lee's Fist of Fury. Even so, it still works. Video quality is quite decent with sharp images, vibrant colours and deep blacks. There are no errors whatsoever and the audio supports Dolby Digital 5.1 which sounds thoroughly cool through our surround sound system. In terms of special features, there is a Making of, behind the scenes, deleted trailers and original trailers. Definitely quite a bit for a non-Western film and actually quite engaging. 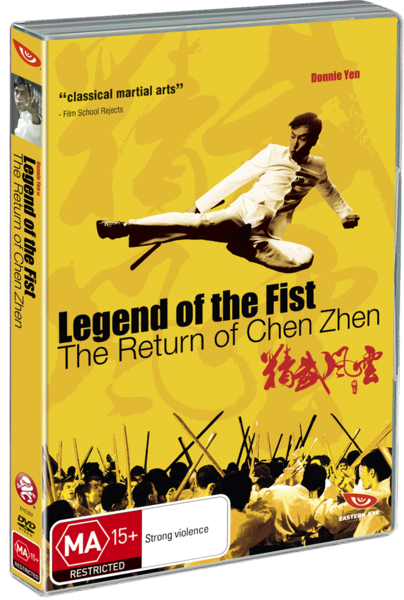 At the end, Legend of the Fist: The Return of Chen Zhen is an interesting take on the original premise and does to some extent pay some homage to Bruce Lee, even though it's more money spinner than true sequel... prequel... whatever! However if you're a fan of Asian styled action movies, than go no further but if you're still a little dubious, rent it first!